Retinol or Vitamin A is a cosmetic ingredient found in many anti-aging skincare products such as eye creams, serums, and facial creams. Retinol can also be broken down into other forms, such as retinyl proprionate, retinyl retinoate, retinyl palmitate, and retinaldehyde. These are all also found in other skincare products. They’re sought after for their revitalizing formula even though they have some bothersome side effects. You’d think it’d be a simple task to put on retinol. Just follow the instructions on the packaging or label, right? However, retinol usage is also tricky because it has side effects like skin irritation for people with sensitive skin. Everyone needs to acclimate into using retinol first by getting a once-daily dose first before moving on to regular doses. It’s not like moisturizer that you can slather on your skin and not worry about any resulting reaction if you put on too much. Here are the things you need to get and do. Retinol Shopping: Find the right type of retinol. As outlined above, it comes in many forms. Prescription and OTC Retinol: Prescription retinol is stronger than non-prescription over-the-counter (OTC) drugstore retinol. Mix and Match: You can use both prescription and nonprescription retinol. For example, use a prescription product once daily and then an OTC one for the rest of the week. Retinol for Your Skin Type: Get a retinol formula specifically made for sensitive, oily, or dry skin to prevent further side effects. Retinol Usage: Learn how you should go about using retinol aside from what’s indicated by the label or by your skin doctor. Adjust Your Skincare Regimen: Your retinol product should be applied after cleansing and exfoliation, followed by whitening lotion, booster, and moisturizer in that order. Night or Day: You can apply retinol at night before sleeping or during the day. However, add sunscreen if it’s for the day. Night is better because you can add more products before sleeping. When to Stop Using Retinol: You should also know when to give retinol a rest. If You Have Inflamed Skin: If your skin starts getting irritated, stop putting on retinol on it. If You’re Using Acne Meds: If you’re using acne meds, stop putting on retinol on your face. If You’re About to Do a Facial Wax: If you’re about to do a facial wax, stop putting on retinol on your face. The Bottom Line: Be careful when using retinol in order to maximize its anti-aging capabilities to the hilt. To get the best results, combine it with antioxidants, moisturizers, and healing ingredients. Here are the things to keep in mind when attempting to use retinol the right way. Finding Your Retinol Type: According to New York medical and cosmetic dermatologist Francesca Fusco, although retinol comes in many variants, they all work the same way. Prescription retinol simply works faster than OTC drugstore products. However, you shouldn’t rush when it comes to retinol anti-aging skincare. It’s better to take your time and start slow. Let your body get used to the topical doses of Vitamin A. This is because your body needs to acclimatize first with the agent. It can’t immediately react to it without side effects like in the case of some drugs. It’s better to err on the side of caution, buy OTC retinol products, and use it sparingly like once a day or two to three times a week. Work your way up to normal dosage when your skin stops or doesn’t end up irritated and red. Increase it till you can tolerate it every night. Prescription versus OTC: Not all retinoids are manufactured equally. As a rule of thumb, prescription retinol is stronger than OTC ones. Retin-A (also known as Tretinoin) is stronger than retinol because it’s a prescribed product. In contrast, retinol is found in cosmetic products and beauty creams sold at drugstores nationwide. OTC retinol needs to first be converted into retinoic acid in order to work the same way as prescription retinoids. In other words, if you’re looking for fast results, maybe make sure retinol won’t induce bad side effects on you first. Also, consult your dermatologist about getting a prescription of some form of retinoid product. However, if you have sensitive skin, it’s better to err on the side of caution and try out the gentler drugstore version of the agent first. If you really want to get a prescription retinoid then you should use it twice a week. Using Both OTC and Prescription Retinol: If your skin is sensitive to cosmetic products and you tend to use mild soaps and creams because you always break out in hives and redness with stronger stuff, then consult your dermatologist for the best option. Some skin doctors have prescribed patients prescription medicine taken once or twice a week while the rest of the week you can instead take OTC retinol. Mixing and matching prescription and OTC retinol his is an excellent way to help your body acclimatize to the anti-aging and skincare agent, especially if you’re dealing with strong retinoid products that you can’t possibly take daily or twice daily. What’s more, OTC retinol products tend to add other ingredients like peptides and caffeine depending on what it’s being used for (anti-aging formulas or skincare moisturizers) to enhance the effects of retinol. A Retinol Formula for Dry, Sensitive, or Oily Skin: Another way to deal with those who have sensitive skin is to find a retinol formula that’s specifically formulated for them. If your skin is sensitive to most cosmetic products, then it’s likelier you won’t be able to easily take or acclimatize to retinol whether it’s a prescription or nonprescription product. You can check the label or ask the pharmacy for a retinol product that matches your skin type. Dry skin typically needs a formula with loads of moisturizer. Oily skin instead requires a formula to dry it out in contrast to mitigate oil-based inflammation (like a zit breakout). As for applying the product, put on one or two pea-sized amounts prior to sleeping. Also, avoid the corners of your mouth, nose, and eyes as well as your upper eyelids. These are the more sensitive areas of your face. How to Use Your Retinol Product Itself: Once you’ve gotten your hands on the right retinol product, you should use it as instructed by the label or as prescribed by your dermatologist in light of what sort of skin you have (dry, oily, or sensitive). Remember also that retinol tends to accumulate in creases, resulting in flaky or cracked skin. Your nightly skincare routine might need adjusting to your specific retinol product. For instance, you need to prep your face first with an AHA or BHA product first by cleansing, toning, and exfoliating it. You don’t need to wait for the exfoliant to absorb though. From there, put on your retinol serum or facial cream while keeping in mind the reminders outlined above. You can apply the product on your chest, neck, and face. If you’re using skin whitening lotion, apply it after applying the retinol rather than before. Your Skincare Regimen and Night versus Day: After cleansing your face with AHA/BHA products, putting on retinol facial cream, and applying your skin whitening lotion (if any), then that’s when you should but on your booster product followed by your moisturizer, eye cream, and/or moisturizing serum. Always apply retinol after cleansing and exfoliation instead of before it then moisturize your skin last to get the best possible results. In regards to applying retinol during the day, you can do that too. However, you need broad-spectrum sunscreen rated SPF 30 or higher along with your retinol application since you’ll also be out and about in the sun all day. It’s better to apply retinol cream at night because most people won’t mind layering an extra product on the evening. In the daytime, you only have time for fewer creams on your face, so it’s just sun block and retinol. Give Retinol a Break When Your Skin Is Red: If your skin becomes irritated, flaky, red, and dry as though it’s getting really “angry”, then give retinol a break. This specific side effect of topical Vitamin A in particular is why this article exists in the first place. If retinol were any other skin product out there (where you slather it on then rinse it off nightly), you wouldn’t even need all these warnings and tips at all. 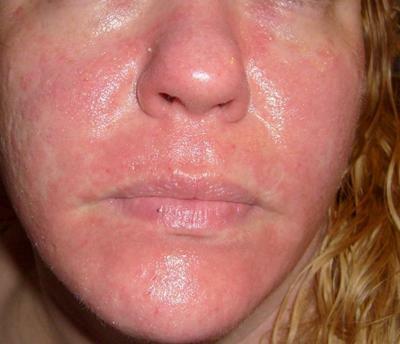 However, the fact that whenever you’ve applied too much of it or your skin isn’t used to it (as in the case of many a first-time user) your skin turns red as if suffering from an allergic reaction is why you should follow steps like this. If this happens, stop using retinol immediately. Try out an OTC cortisone product instead as a replacement for a few days then apply retinol again. Acne Medications and Retinol Don’t Mix: If you’re using acne meds, stop using retinol immediately. Don’t mix retinol and anti-zit treatments together. Don’t be fooled into thinking that just because retinol is sometimes incorporated with pimple products that means you can mix retinol and pimple cream together. The dosages of retinol in acne formulations is highly controlled and tested thoroughly. It’s a major mistake to combine the two because some acne meds contain alpha hydroxy acid, glycolic acid, and/or salicylic acid. This combo can knock your face out in terms the resulting redness and flakiness. Instead of getting clear skin and fewer wrinkles, you might end up instead with a wrinkle-prone and highly inflamed face full of redness, irritation, and burning or more zits. Combining the two agents or products together can result in them defeating their very purpose of being. Waxing After Retinol Use Is Not Recommended: If you’re going to wax your face, don’t do so while under retinol treatment. You might as well cancel that wax appointment. In turn, if you want to wax your face and don’t wish to stop the waxing session, then instead stop taking anymore retinol for a little while. There should be a good period of time after you’ve stopped retinol treatment before going through with your wax. The reason for this is because retinol treatments make the skin sensitive and vulnerable. If you wax your face in the middle of your therapy, you can end up ripping your face off because it’s so sensitive and weak right now. Either delay your waxing until you stop using retinol or stop using outright retinol and wait for a dermatologist-approved grace period before going through with your facial wax. Retinol Usage in a Nutshell: Retinol should be used carefully. Read all the warnings on the label. Take note of the recommendations of your dermatologist. Start slow and work your way up into building up your tolerance for this topical Vitamin A agent. This way, you can smoothen your skin, prevent fine lines from forming, and get younger skin in 2-4 weeks with prescription formulas. It takes a little bit longer (6-12 weeks, in fact) for OTC options to get the same effect. You have a lot of formulations to choose from as well as reputable or unknown brands. There’s a retinol product for every skin type and individual. To get the best results out of your retinol facial cream or lotion, feel free to use it with other anti-aging products containing antioxidants or moisturizer. Just don’t use acne products with it. Did you enjoy this tutorial? It’s a list that’s compiled in order to go with which over-the-counter, dermatologist-approved steps are needed in order to properly use retinol with the fewest side effects possible. Retinol and other retinoids are quite tricky to use. However, once your skin gets used to them, you’re in for a treat. It’s something that’s good for your skin because it’s a skin restorer. Like tea tree oil or grape extract, it also helps you heal from skin injuries, restoring your skin to health while minimizing the occurrence of scars, pock marks, and other cosmetic disfigurements. Whether you’re getting retinol at a concentrated dose or as part of a lotion formula, methodical carefulness is what you need to maximize its worth. Retinol also works best with restorative ingredients like niacinamide, skin-replenishing ingredients like moisturizers, and rejuvenating ingredients like antioxidants.